As long as you have saved SHSH blobs and do not rely on an unlock for your iPhone 4S you can easily use RedSn0w 0.9.11b1 to downgrade your A5 iOS device. Note #1: If you are on the Windows operating system please click here to follow the Windows version. Note: The iPhone Dev-Team left out one version of the iOS 5.0.1 firmware in RedSn0w 0.9.11b1. Thus, when downloading the iOS 5.0.1 firmware make sure it is build 9A405. You will also need to make sure you have both the iOS 5.0.1 (9A405) firmware and iOS 5.1.1 firmware downloaded to your computer for the A5 device you are trying to downgrade. For those that need to download these iOS firmware files you can turn your attention to the iJailbreak Downloads Section. Step 2) – With all the required files downloaded you will need to put your A5 iOS device in DFU mode. For those of you who do not know how to do this you can click here. Step 3) – The next thing you will need to do is simply launch RedSn0w. Step 4) – With RedSn0w up and running go into the Extras menu. Followed by the Even More menu. And finally the Restore menu. Step 5) – From here you will need to select your iOS 5.0.1 firmware file, followed by your iOS 5.1.1 firmware file by clicking the IPSW button. Step 6) – After your firmware files have been successfully verified you will need to turn your attention to the Blobs section. For those of you who Jailbroken your A5 iOS device in the past and saved your SHSH blobs via Cydia you can simply click the Remote button. If you have not saved your SHSH blobs via Cydia however, but rather with a tool like TinyUmbrella, then you will need to click the Local button and locate them on your computer. Step 7) – Ater your SHSH blobs have been verified you will simply need to sit back and wait for your A5 iOS device to be downgraded. This process can take over 10 minutes, so be patient and do not disturb your device during the restoration/downgrade process. 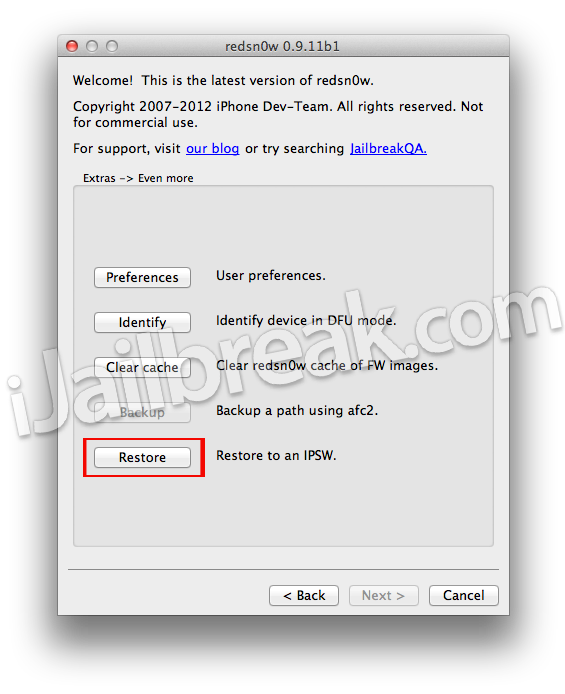 how fix restoring for this ipsw 5.0.1 9A406 is not currently available !!!!!! You need 9A405, not 9A406. What basebands are under A5? Where is 5.0.1 for new Ipad??????? Why you said downgrade New Ipad in your title when there is no iPad 3 firmware 5.0.1.. New iPad comes with 5.1 pre-installed.. ??? if you have a solution.. what it is? hi I’ve successfully downgraded to 9A406, however, while I tried to restore my data back to my downgraded iPhone4S, it tells me that the firmware is too old to restore. Any suggestion?